In the 1970’s a group of engineers from Japan visited Sausalito to study the Golden Gate Bridge and in 1978–88 an amazing bridge was built in Japan between the City of Sakaide on Shikoku Island and the City of Kurashikion Honshu Island, linking several islands to mainland Japan. Officials from Sakaide came to Sausalito in 1988 and placed a plaque at the southern end of the Golden Gate Bridge, acknowledging the similarities between their feat and our beautiful bridge. In a proclamation recognizing the bonds of friendship between the City of Sausalito and the City of Sakaide, the two cities agreed to establish a formal sister city relationship. The agreement was formalized on February 2, 1988 to “encourage the continued interest of our two communities in cultural exchanges and in the promotion of reciprocal visits by representatives of the two cities in the fields of commerce, government and the arts.” And thus a strong relationship between Sakaide and Sausalito was forged. We must honor and thank those engineers from Sakaide who initiated our Sister City relationship. 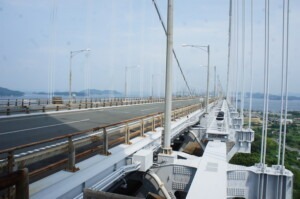 It was because of their foresight and enthusiasm that we have enjoyed our rich connection since 1988, the year in which the Great Seto Bridge opened.